Cooking eggs in the oven is EASY! Baked hard boiled eggs in the oven take 20-30 minutes. 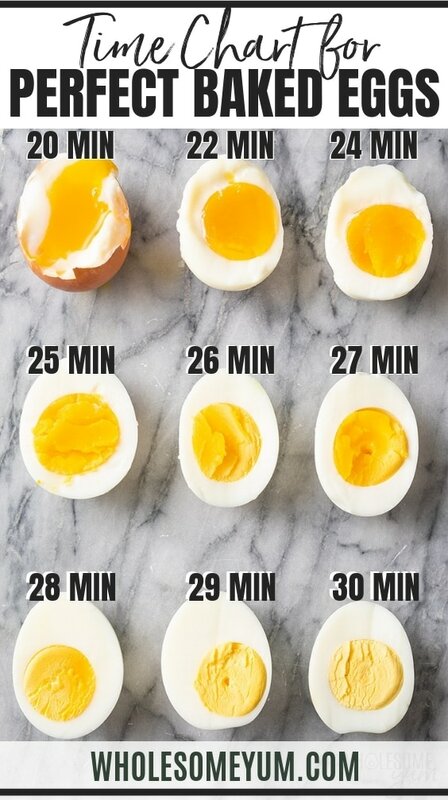 For both soft or hard boiled eggs, here's a TIME CHART for how to boil eggs in the oven. 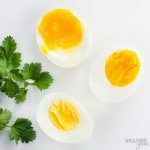 Eggs are my favorite food in the world, so it was only natural to create a guide for how to boil eggs perfectly. 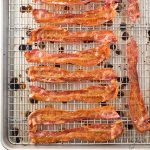 Today I’m sharing my method for how to hard boil eggs in the oven, along with a time chart so that you can make them hard or soft boiled to your liking. 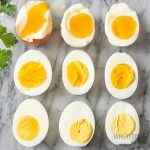 Baked hard boiled eggs in the oven are super quick and easy – it takes just a minute to pop them in. Plus, I love that I don’t have to watch them when cooking eggs in the oven. Obviously, yes! And you have to bake hard boiled eggs ASAP if you haven’t tried it yet. Why Make Baked Hard Boiled Eggs? The reason I wanted to test how to make eggs in the oven is for the time savings and ease. Boiling eggs on the stove top requires some level of attention, but you don’t have to worry about that when you’re cooking hard boiled eggs in the oven. With the oven method, I can just set a timer and walk away from the kitchen. So convenient! There are many different options for cooking eggs in the oven – poached, scrambled, quiches, and more. Lots of choices for oven baked eggs! Preheat the oven to 350 degrees F and place eggs into a muffin tin. Plunge the eggs into ice water for 10 minutes. That’s it – you can make soft or hard eggs in the oven in no time! Now the big question that no other tutorial online covers – how long do you cook eggs in the oven? Many sites recommend 30 minutes at either 325 or 350 degrees, but I wanted to show you a visual so that you can decide how you like your eggs done. You can make hard or soft boiled eggs in the oven… or anything in between – your choice! The time will vary a bit if your oven runs hot or cold, or if your eggs are larger or smaller than mine (I used organic large eggs). You may need to adjust +/- a couple of minutes, but you’ll know that after the first time you make them. Will Hard Boiled Eggs In The Oven Explode? No! I’ve heard this myth floating around, but have tested this method several times and never had the eggs explode. I’m guessing it’s possible if you overcook the eggs significantly, but as long as you follow my time chart, you should have explosions while cooking eggs in the oven. Does Cooking Eggs In The Oven Make Them Easy To Peel? Peeling baked hard boiled eggs is about the same as peeling eggs that were boiled. Firmer eggs are easier to peel than soft boiled ones. For soft boiled, it’s best to use an egg cup and a spoon. Plunge the eggs in ice water for a little while after cooking. 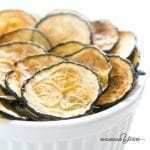 This crucial step is not only to stop further cooking – it also makes them easier to peel. Roll the egg on the counter before peeling. This helps the egg inside separate from the shell a bit before you peel it off. When it comes to storage, hard boiled eggs baked in the oven aren’t any different from stove top ones. Simply refrigerate them. 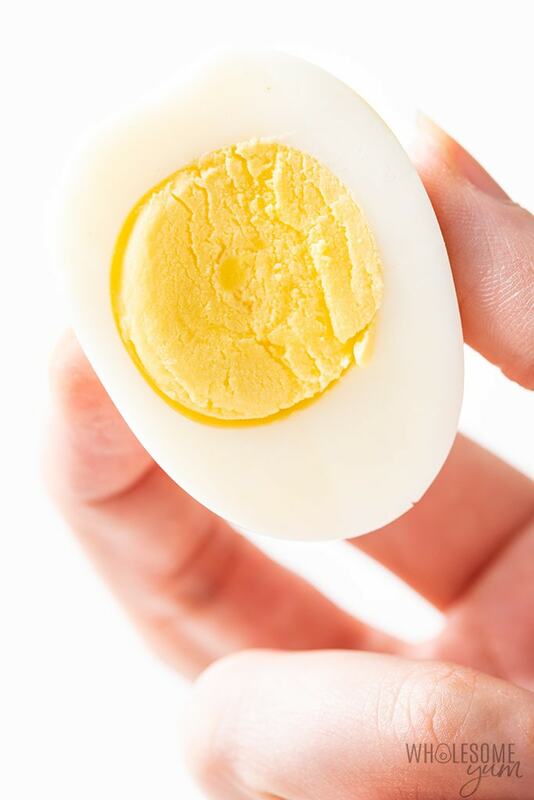 After you master how to hard boil eggs in the oven, you can store them in the fridge peeled or unpeeled. They keep for just a few days peeled, or approximately a week if you store them in the shell. Now that you know how to bake eggs in the oven, here are some ideas for what to do with them! Avocado Toast – Soft boiled eggs are great over avo toast! 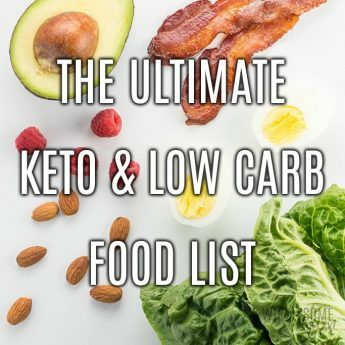 Use keto 90-second bread for yours if you want a low carb version. 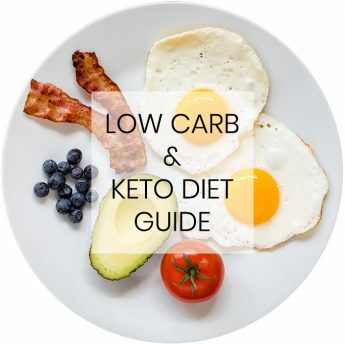 Eggs & Soldiers – Use sticks of your favorite bread (try my low carb almond flour bread!) 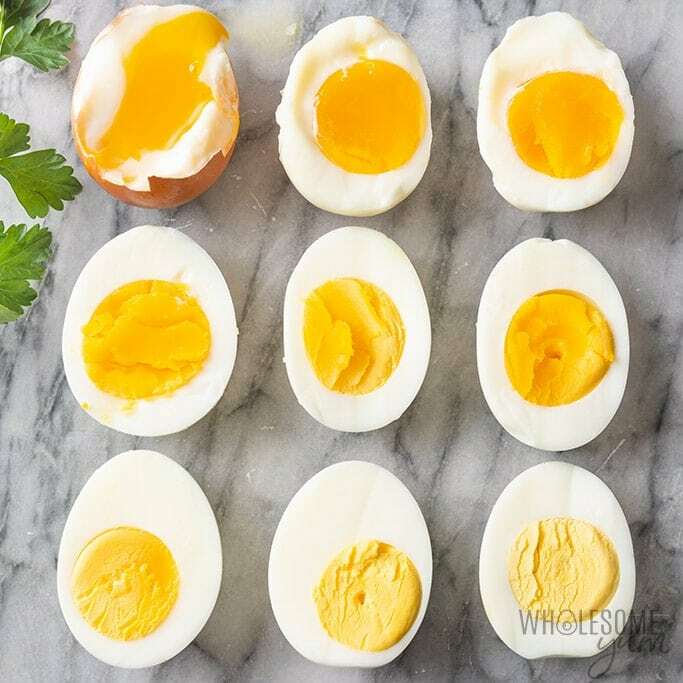 to dip into the soft-boiled egg. 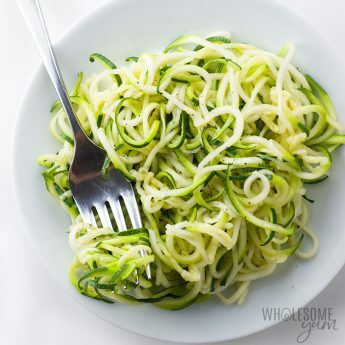 For healthier options, try cheese sticks or veggie sticks. 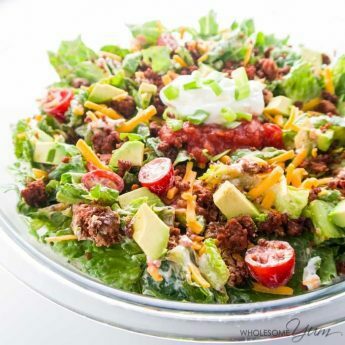 7-Layer Salad – The perfect make-ahead salad that will utilize lots of boiled eggs at once. 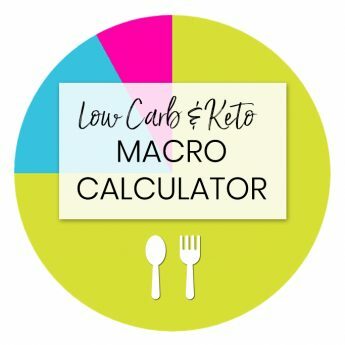 Cauliflower Potato Salad – I actually have two similar recipes for this. Try my other cauliflower potato salad recipe here. 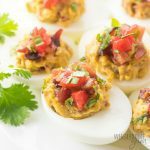 Deviled Eggs – So many options for these! Try Mexican deviled eggs or jalapeno bacon deviled eggs. Muffin Tin – Baked eggs in a muffin tin cook most evenly, so get one if you don’t have one! Leak-proof Ice Cube Tray – Just like other methods for boiled eggs, baking eggs in the oven requires plunging them into ice water after cooking. I love this ice cube tray because it doesn’t leak in my freezer before the ice is solid, so I can put it vertically or diagonally to save space. 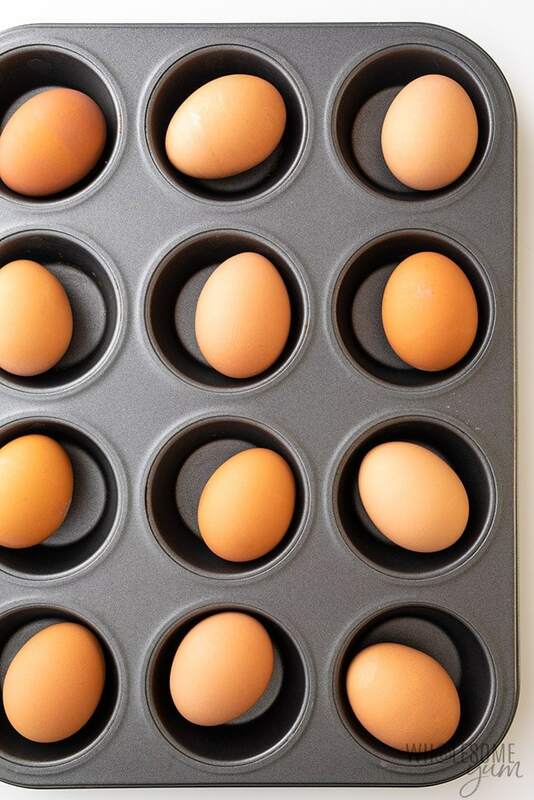 Place one egg in each cup in a muffin tin. Bake eggs for 20 to 30 minutes for your desired level of doneness. Eggs in the oven will take 20 minutes for very soft boiled, 30 minutes for fully hard boiled. See the chart in the post above for baking times in between. Meanwhile, prepare a pot of ice water. 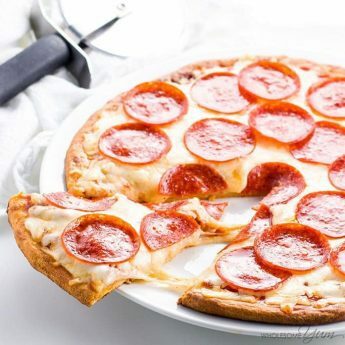 As soon as you remove the eggs from the oven, immediately plunge them into the ice water, and leave them there for 10 minutes before eating or peeling. Always looking for simplicity! We can never seem to keep hard boiled eggs around here! Thanks for sharing! Hi Maya, thanks so much for the chart. I’ve been baking my eggs in the oven but never thought to cook them for less time for a softer egg. Btw, I did have 1 egg explode in the oven. I was cooking 6, and the other 5 came out perfectly cooked. I have no clue as to why that happened. Should the eggs be at room temperature or fresh from the refrigerator before putting in oven? Thanks. Looking forward to cooking hard boiled eggs in the oven! Hi Leo, The times are based on fresh from the fridge.